I’ve done many articles about bike maintenance, but one area that I realize I haven’t addressed is safe bicycle riding. You can have a properly maintained ride, but if you are not careful out there you could be killed or maimed. So the first thing you must have in mind at all times in your head when riding your bike is this: BE ALERT AND BE AWARE. I don’t care if it’s a beautiful sunny day on the bike path and traffic is light, if you don’t pay attention to what you are doing with your head in the clouds and your eyes on the pretty birdies, you open yourself to whatever will happen to you. Unconsciously riding your bike anywhere but in your driveway is THE recipe for disaster. Keep tabs on what is moving and not moving around you. Look ahead and anticipate what the other guy might do, may he/she be a pedestrian, driver or even another cyclist. Keep an eye on the road surface as well, missing manhole covers and crater sized potholes can seriously ruin your day. This might sound complicated and impossible to do, but consider that you have an unobstructed view of everything, your rate of speed is a lot more manageable than a car or motorcycle and, if your brakes are in good condition, you can stop pretty quickly on a very short distance. Being aware is not just about your surroundings, it is extremely important, but it is also about being aware of yourself and your bike. What kind of rider are you? Fast, slow? In what condition is your bike? Good brakes, gears working properly, anything about to break on it that you are aware of? Take all these things into consideration before that first push of the pedal. I ride around on a big cruiser sometimes with very bad brakes (for my taste anyways) and knowing that fact I will ride it very casually at speeds that I know it can stop fast…relatively speaking of course. You will never catch me doing stupid stunts in weekday traffic on that thing! Ah yes the safety and convenience of bike lanes…NOT! Even the best case scenario of the protected and dedicated bike lane that physically keeps vehicle traffic away from you has it’s dangers, just imagine what the painted line on the ground variety is like. The list is long in both cases: Opening car doors, unconscious morons on foot using or crossing without looking, Lance Armstrong wannabes, kids sent there by there mothers with their tricycle doing donuts, kids or regular brain-dead cyclist weaving from side to side, parked maintenance vehicles or moving vans, rollerbladers taking both lanes to skate, wheelchair type scooters, and a whole bunch of other things that I’m sure some of you could add. Keep this in mind next time you go for a leisurely ride. The one that freaks me out the most are the mothers walking their baby stroller right in the middle of the path, I think these ladies failed their physics class since a rider and bike moving at 30 km/h can cause serious damage if they or their baby gets hit. Hopefully that rider will have read this post an managed to avoid her in time. This has never happened to me, but I’ve had two close calls. From what I’ve gathered when talking to victims of this type of incident, deceleration is instantaneous and extremely painful. One cyclist ended up in intensive care last week clinging to life after being doored. She bounced off the door and was projected onto incoming traffic and got hit by a truck. When riding next to parked cars, keep an eye inside the vehicles and side mirror to detect movement inside. If you can’t see the inside of a car because of tinted windows or other reasons, take for granted that it is occupied and prepare to evade or stop. Keep an eye on the traffic behind you at all times. I’ve equipped all my bikes with a decent bell so that when I see movement in a car I ring it to make sure the occupant is aware that I’m there. So far it’s worked wonders. When riding with traffic you have to take some precautions and adapt your way of riding. Never ride facing oncoming traffic, it’s a myth that it’s safer. Drivers find you out of sync and might not react well, at night your red rear reflector or light is not visible and neither are you. Avoid sidewalks at all cost, it is dangerous for pedestrians and illegal in most places. Don’t forget to keep an eye on what’s happening behind you and keep your ears open. Use all the feedbacks from the road, may it be visible or audible. Never forget that in a hitting contest the car will always win. If you have priority and a driver decides otherwise, don’t insist or you might get killed to get your point across. When you get to an intersection and there is more than two cars competing for the right of way, play it safe. Stop, sit up on your saddle and cross your arms over your chest. This way the other users will see that you are not going anywhere. You can now wait until they’ve all settled their arguments, in a matter of speaking, moved along and safely go through once the intersection is clear. Those few seconds that you’ve waited will insure that you can ride on instead of wasting some precious riding time in a hospital bed. Blasting thru stop signs and red traffic lights is of course extremely suicidal. At least take the time to slow down and look both ways. Yes it’s true. Either it’s because we look different, save money on gas or just because we seem to enjoy ourselves and the world, some people find this offensive in the sense that everybody should be as miserable as they are or they are simply stupid period. This type of idiot can try to aggress you with his/her car or throw things at you just for the hell of it. In this type of situation it is imperative that you avoid and evade immediately. Your first priority is your safety and survival, Police reports and arguments will have to wait for later. A car as tons of horsepower, but you are extremely mobile and you can go anywhere. Go places a car can’t go or follow you, keep moving and if you have to, even consider going against traffic. Once you’re in a safe place you can call the Police if need be. Bikes usually come equipped with reflectors and most people think that this is enough to get by when riding at night...WRONG! Nothing beats a good front light and a red blinker in the back. LED equipped bicycle lights are now available in both red and white. They are inexpensive, easy to find and don't require a cumbersome dynamo to slow you done. If you want total visibility at night, throw in a lime yellow safety vest and only a total blind man or idiot won't see you. There is no technical reason why you should ride at night without being visible. Reflectors are only good so a driver can notice you seconds before he/she plows into you. In your mind, prepare yourself for any and all problem that you might encounter while riding. You would be surprised at the difference it can make in any situation. 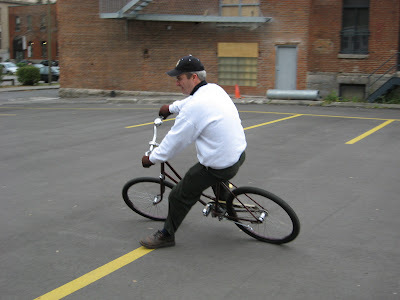 Lastly I will quote a Montreal bike courier who once told me this: “I ride as if I was invisible.” That means that you always take for granted that nobody sees you and you ride your bike the proper way, defensively. Til next time DO ride safe and Godspeed. "I consider myself a very safe and alert cyclist based on many years of riding a motorcycle with the attitude that "everyone out there who can get me, will" and always having an exit plan. I commute 14 miles each way 2-4 days a week to work. I have since given up the motorcycle after my dad lost his life to a drunk driver riding the motorcycle on which I learned. One situation I never anticipated caused a friend of mine a broken jaw and over a year's worth of surgery. Road conditions were excellent: sunny, dry, and clean roadbed. There was a nice bike lane and the street was long, straight, relatively flat with infrequent cross streets. My friend was in front of me on a road bike, me behind on my Vision recumbent. Traffic was heavy and stop and go while we were cruising along at about 12 mph. A medium sized panel truck stopped in traffic just ahead of us, but since traffic was stop and go we didn't think anything of it. However, the panel truck driver had actually stopped to allow an oncoming truck to turn left into a business driveway (i.e. in front of the panel truck and across our bike lane). The turning truck accelerated and roared in front of us, giving us no time to see him and stop in time. My friend's jaw hit the bottom edge of the turning truck's flatbed. His jaw was broken and he endured over a year of oral surgeries including a length of time with his jaw wired shut. Had I been in front, I would have gone under the truck due to my lower riding position. I shudder to imagine what that would have been like. I am used to watching out for traffic turning in front of me from behind, in front, and the sides, which is common at street intersections whether there is a bike path or not. What I learned from this experience was be very wary during stop and go traffic when obscures my vision of oncoming traffic. Thanks Toby for sharing your experience. Labels: "bicycle safety", "bike blog", "bike riding", "safe riding"
Re dooring, here's better advice - don't ever, ever, ride in the door zone. Ride far enough to the left so that no door, when opened, can hit you. It's impossible to tell, at bike speeds, if cars are occupied. And, if you actually see a car ahead that is occupied, how quickly can you safely merge to the left? Better to just stay to the left. Excellent comment, however it is sometimes impossible to avoid the door zone (I'm thinking one way streets with cars on both sides), that's what the tip was aimed at. But you are right, avoiding it out right is the first course of action when possible. And don't forget to wear a helmet! whisper, I taught that the helmet would make the first comment. Yes you are right, wearing is a very good idea. This is a great article, one of your best (and that says a lot)! I'm glad you included aggression/hostility toward cyclists. It's not pleasant to think about, but it's there, and it's good that you mentioned it. No one wants to think that drivers might intentionally harm a cyclist; usually it's because they are lazy/not paying attention/etc. But it definitely happens. Thanks Johnny, I take your compliment to heart. It is a sad state of affair, but true that we are not always safe when out in the world. I'm not saying that we should be paranoid all the time,(Our governments make sure of that already), but people should be aware of their surroundings at all times once they leave the front door of their house. I still can't understand it when people go about their business in the public domain without a worry in the world thinking that nothing can happen to them. Individuals that are alert, without being paranoid, are in general noticed and avoided by aggressors, whoever they may be. Always stay alert and you'll stay alive. "Always stay alert and you'll stay alive." Heck, in this world of everyone moving so fast that nobody even considers that anyone might be outside of their cars, bicycling isn't the only time you can get doored. In the parking lot of the mall this weekend, I was almost doored while walking. WALKING, mind you. It's pretty nuts. You need to be doubly cautious when you're traveling on two wheels wearing the equivalent of spandex underwear while traveling at 20mph or more! Thank you so much for sharing this and reminding us all to be safe. Might I add... Take the lane! Don't hug the parked cars! Taking the lane forces cars to move into the other lane to pass you, making it much less likely for them to "clip" you. It also obviously makes you safer from dooring. One because you are out of reach and two because you aren't in the driver's dead angle anymore! And it makes you more visible. The same is true at intersections and for driveways. The only reason you should hug the curb is if a motorist is clearly going faster than you and has no way of passing you safely. In which case you'd let him pass and then take the lane again. If there are so many cars that you're always hugging the curb, try taking another route. And this one is for faster riders, I find that taking the lane better illustrate our true speed. Most drivers have this preconceived idea that a bike can only ride at 10kmh. I'm still often passed in traffic on in 30 zones by vehicles only to have them stay right in the front me for the rest of the ride. I also avoid the "right turn" lane at all cost. Drivers just don't look on the rear right side before turning, and people in the other lane will often suddenly decide to go into the turn lane. Oh and although I still do wear mine, some researchers have noticed that wearing a helmet actually has an adverse effect. Drivers become slightly more careless around you! Many thanks for that great comment and valuable advice xsmurf. This is what this blog is all about. However, you won't see me riding with a blonde wig anytime soon. No kidding the same thing that happened to Toby's friend just happened to me...as in a few minutes ago. I'm a student in Philadelphia and I buried my front wheel in the side of a turning car while riding to class this morning. Fortunately for me a just banged up my collarbone and have no serious injuries. Lesson learned: definitely expect turning vehicles when approaching an intersection in stop-and-go traffic. My wipeout must have looked pretty spectacular, though. Glad to hear that you're OK Max.